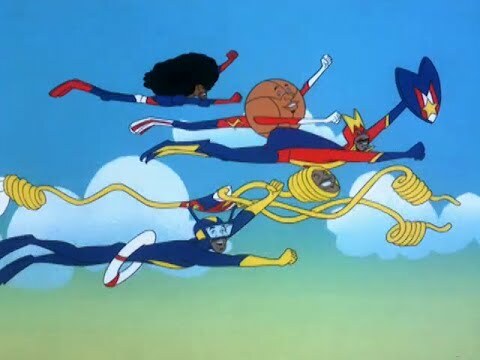 The Super Globetrotters cartoon was actually a spin-off of the original Harlem Globetrotters cartoon. In this version they were both basketball players and undercover Superheroes who transformed by entering their magical lockers. They were alerted to crime by their basketball shaped talking satellite called the crime globe. Each had their own individual power plus the power of flight along with their incomparable basketball skills. The team consisted of five members, Liquid Man, Super Sphere, Spaghetti Man, Gizmo, and Multi Man. I remember three of the members seemed pretty close in abilities to the characters of the Impossibles cartoon but I forgave them as they were an all Black Superhero team, possible the first ones ever on Television. They weren’t very smart but neither were the villains. The show was standard Hanna Barbara Saturday morning cartoon fare and I liked it. One of the things I remembered from the show was that they were different shades of Black. I hadn’t seen such a thing before. The series debuted in 1979 and ran for only one season (13 episodes). None of the actual Globetrotters voices were used but Scatman Crothers voiced the lead in this and the previous series.